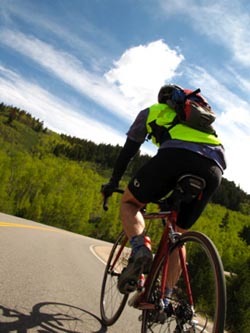 Rocky Peak Productions announces the Kent Eriksen Tour de Steamboat Century Ride. In its 4th year we join forces with Prudential Steamboat Realty to raise money for the Sunshine Kids Foundation. Along with the benefit two new routes (40 and 20 miles) were added to the existing 110 mile ride as well as a family oriented core-trail route. "We are really excited about our new partnership with the Sunshine Kids and Prudential Steamboat Realty," said co-director Katie Lindquist. "The ride grew in its first couple of years to a point where we have the numbers to make this ride a real benefit to a deserving group of young individuals, The Sunshine Kids." The Sunshine Kids Foundation adds quality of life to children with cancer by providing them with exciting, positive group activities so they may once again do what kids are supposed to do: have fun and celebrate life! Young cancer patients are provided opportunities to participate in positive group activities which promote self-esteem, personal accomplishment and just plain old fashioned fun! We are encouraging more participants this year by incorporating three more rides of varying distances. "Anyone can join in the fun and get on a bike and ride for a great cause," says co-director Brad Cusenbary. "We really want to make this a family event." The Tour de Steamboat boasts limited numbers of riders to maximize the experience for all. "We want people to feel like they are on a big group ride, not a cattle drive," says Lindquist. "Loyal locals and native Colorado riders have joined us year after year; they love the intimate size and feel of the event. Good people, scenic routes, great organization and lots of food afterwards are hallmarks of this event." All rides will start at 7:00am with an escorted roll out along river road, in downtown Steamboat Springs. Rides split off into respective distances after the group lead out. Following the event is an ongoing street party and BBQ with live music. Participants are invited to bring the whole family to the post ride feast. Food, beer and soft drinks are complimentary to riders; extra tickets can be purchased in advance. Pre-ride pasta feed and benefit dinner will also be planned with an opportunity to hear the Sunshine Foundation's "spokekids" give some background on this incredible organization and their experiences. Rocky Peak Productions is a cycling event promotion company. Its founders and directors are cyclists who provide other cyclists outstanding events for competition fun. Our office is located in Steamboat Springs, Colorado and we welcome your comments or questions anytime. To learn more about this terrific event check out www.rockypeakproductions.com and be sure to register early for great savings.